They were the best of friends and the most daunting of bachelors....Charlie Harrington, a handsome philanthropist, has such high expectations for his perfect bride that no mortal need apply....Adam Weiss, a forty-something celebrity lawyer, prefers his women very young, very voluptuous, and very short-term….And for Gray Hawk, a gifted artist with a knack for attracting troubled relationships, women are fine; it’s just the idea of family he can’t imagine (particularly the family of the woman he’s dating). Now the three friends, spending their annual summer vacation cruising the Mediterranean aboard Charlie’s majestic yacht, are about to have their bachelorhood rocked. By autumn all three will fall precipitously into relationships they never saw coming. Charlie begins dating a crusading social worker who couldn’t be further from his ideal–until he makes a stunning discovery about her. Adam gets involved with his usual twenty-something bombshell–only this one has a remarkable mind of her own. And Gray, who has avoided both business and family like the plague, has managed to fall head over heels for a successful career woman– who just happens to be a mother as well. As another holiday on the yacht approaches, and with it a turning point in each man’s life, the three bachelors are forced to face the things that scare them most: their phobias about relationships, the wounds of the past–and the kind of women who challenge their deepest terrors. What happens next will spark big changes for Charlie, Adam, and Gray–and might just put an end to their carousing days forever. For as the once-carefree trio is about to discover, love is the most unpredictable adventure of all. Filled with all the joy, complexity, and unexpected surprises of life, Toxic Bachelors is Danielle Steel at her poignant and penetrating best. I enjoyed this book. However, it was very predictable and left little to the imagination. It was an easy smooth listen. 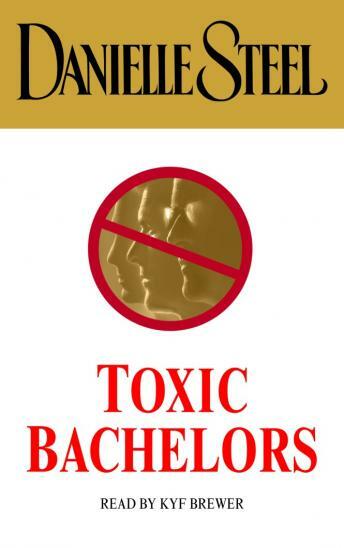 I didn't quite understand the title "Toxic Bachelors," as none seemed to be. I thoroughly enjoyed this one. Look, it's Danielle Steel. It's fast food for the mind. You know what to expect. You know how it will end. While frequently the bachelors were frequently annoying, the female characters were quite likeable. I particularly enjoyed Kyf Brewer's narration.